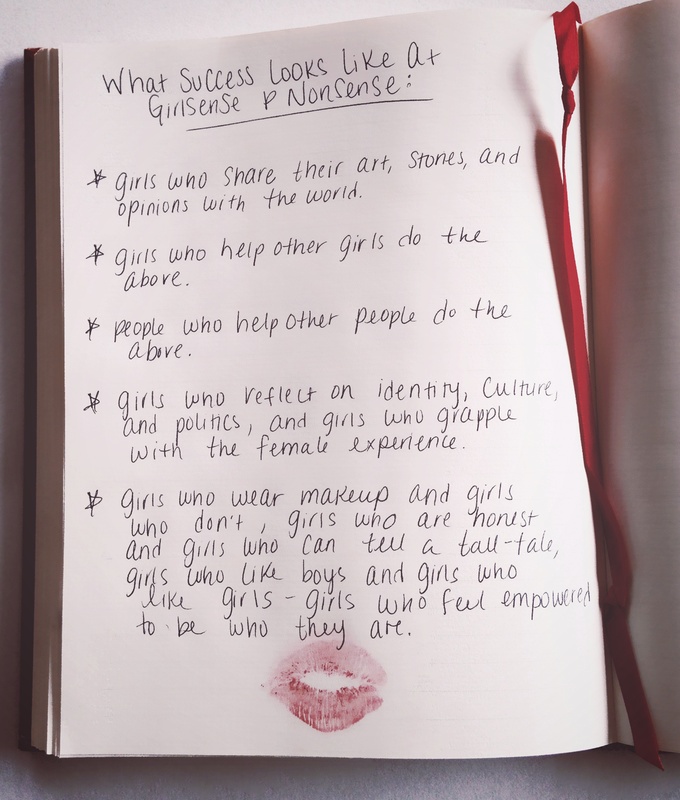 The editors of GirlSense & NonSense Magazine have been very honest on this blog about a lot of things: why this magazine exists, how sometimes we feel inadequate and overwhelmed, how much we love what we do, and how much we’ve learned about ourselves as artists and as young women. 1) I became so consumed by the number of submissions that I forgot to actually read and look over them until the day of the deadline. (Shame.) The first piece I looked at was Surviving Wintergirl’s essay. 2) Surviving Wintergirl’s essay, “Goodbye and Good Riddance”, adjusted my attitude and forced me to paint a different picture of success for this magazine. The essay also made me cry three times. 3) Hormonal acne is real. 4) The design of the magazine needed to reflect the content and enhance its meaning(s). Duh. Fatima Tall and Jamie Sugai’s poetry slapped us in the faces and made us realize this fact, as did studying 20th century avant-garde magazine design (random). 5) People are more talented than I am, or will ever be. Rachel Anna’ cover art, anyone? 6) A good staff and good friends can really help calm the anxiety and second-guessing at 2am. Thank you to the Spring 2015 artists for being fearless and passionate individuals. Thank you to Sarah and Josh (staff members & friends) for your help and patience. Thank you to Chloe & Hailie, two young women whose title is officially “intern” but could easily run the world. Thank you to Sylvia Fine and KHS Creative Writing for your continued support. And last but not least, thank you readers, for supporting GirlSense & NonSense, reading the magazine, and valuing the work of young female artists. Read the Spring 2015 Issue by subscribing for free here.